I always start the year off S....L....O....W! I think I go into hibernation/recovery mode after the holidays. This year is starting off with a !BANG! but it is leaving me exhausted. nor have I visited many of the links from the Best Of. I will...you better watch out shout outs and spotlights may pop up at any time! 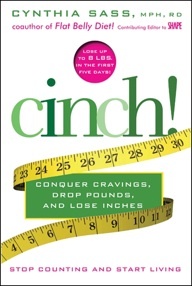 Don't Forget to ENTER my giveaway for the new book Cinch! Giveaway Closes at midnight on 1/11/11. Read my review and enter! The DIY CLub Project Party is happening right NOW! Go check it out for all the details. 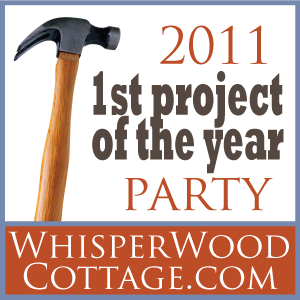 Whisperwood Cottage is having an 11 Day Party to celebrate the 1st Project of the Year! The Design Confidential has a Hand Built Pledge Party going on ALL YEAR! I will be DIYing with a vengeance this weekend-I have have about 500 projects in various states of completion!...so watch out! And my crappy mac is, well crappy - I do not heart the "geniuses" at the Apple Store Genius Bar! - I have an uncanny ability to pick the lemon! So if I virtually disappear, it is because the mac has been thrown into the Pacific Ocean! I have some other exciting news too...but that will have to wait for a bit! celebrating one of my favoritest people's birthday! Have fun shopping:) And thanks so much for hosting! thanks for hosting! Hope you have a great (productive) weekend! Hi Holly! It's Ok to get off to a bit of a slow start. The holidays are exhausting and we all need time to recharge. Just keep that positive attitude going! ... Thanks so much for hosting! I'm getting off to a slow start too but I figure slow and steady wins the race right? Thanks for finding the energy to host! Thanks for hosting Holly and can't wait to hear what your news is. Thanks for hosting Holly week in and week out. Have fun shopping today. I'm feeling the same way-want to get over being tired and then have some fun-hope you have a great time! I always need a recovery period after the holidays, too. And if you choose to follow, Fabulous! ...me, too, Holly..I'm tired...alll the hustle and bustle of Christmas and New Years have left me wanting to stay in bed under my electric blankie and eat and watch movies. I am with you on the slow start! Hope your week is full of pleasant surprises! Wait a minute - what is this "normal week" of which you speak? Hey girlie! So sorry I've been absent for the past few weeks. Things have been crazy! I hope you had a fabulous holiday. Have a wonderful weekend! Maybe this will be the year I do something crafty! =) Maybe.. I know what you mean about being tired -- holidays, travel, life, and the flu pretty knocked me on my bum this year. Thanks for hosting the hook-up! Oh, I do hope your mac gets better soon!!!!!!!!! Happy New Year my love!!! We're all sort of slow these days. But I love you no matter what!